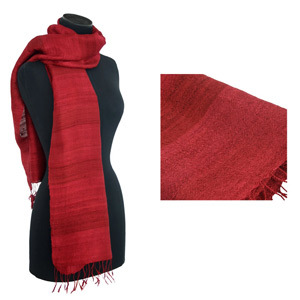 The Isarn weavers weave a gorgeous handmade scarf with soft silk yarn. The lovely chocolate brown color is a striking addition to any outfit, for daytime or evening events. Care instructions: To keep its original appearance Thai silk should be dry-cleaned -never use a conventional washer. If hand-washed, use only the mildest soap in cold or lukewarm water. Always hang silk in the shade to dry, never leave crumpled or creased while wet. Always spray with water until thoroughly damp before ironing on the underside. 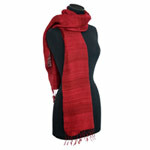 This product is handmade by silk weavers in Isarn (the northeast region of Thailand). The weavers grow silkworms on mulberry trees in their home gardens. The cocoons of these worms produce threads with a rich sheen, which give silk its unique texture. One cocoon consists of a single elongated thread, which is very long. The weavers combined the cocoons individual threads, to make a much thicker and more practical fiber, and coil them round a large reel powered by foot or by hand. If needed, they add dies to the threads obtained. 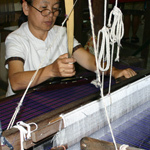 Women then work at their traditional looms, usually set up under their houses built on pillars. With dexterity and precision they weave by hand the strands into intricate and beautiful patterns. If needed, final dyes are then added.